I've been using Quark for my desktop publishing software, but have been wanting to move to Adobe InDesign. I just wasn't looking forward to the learning transition. 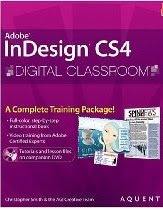 This month, I received a review copy of Adobe InDesign CS4 Digital Classroom from Wiley Publishing and tried it out. It wasn't near as painful as I thought it would be! Adobe InDesign CS4 Digital Classroom is better than a classroom. There's no waiting for others to catch up or missing a tip because I'm busy practicing something else. I can do the video on my time, in my home, at my pace. I love that! The instruction is excellent - very clear and easy to understand. The book comes with a DVD (includes video training from Adobe Certified Experts) and lesson files. I can watch the video and work on the lesson files at the same time. The instruction is well organized enabling me to work through the lessons one by one in the order presented or select a specific topic, as needed. The graphics and sound quality is professional and positively enhances the learning experience. In the lessons, you’ll learn all the essential skills you need to get started. The first lesson teaches you all about the tools. Although I had used InDesign a bit before, I learned a lot of nifty tricks from this lesson. For instance, how to set up my master pages so that they are horizontally rather than vertically aligned. This is important when you work on large documents like books. For a novice like myself, this book and training DVD is just what I needed to get started. For Intermediate users, you will probably benefit by picking up some tricks to help you use InDesign more effectively. Visit the www.digitalclassroombooks.com Web site for updated lesson files. For more information, see the Wiley Web site.